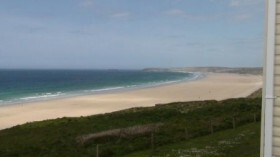 This article is not about the caravan site we stayed on but about Hayle and it’s stunning beaches. Hopefully it will give you a flavour of what we as a family found to there and within the area. Hayle is a small Cornish town that is based around an inland estuary, it has some small shops along the front which looks onto the estuary, at first I thought they looked a little old and worn but when I went to shop they are really very good shops, homemade bakery, fruit and veg shop, different clothes shops all quite interesting, yes they do look a bit worn but there is a friendliness there that is lacking in the large modern shops. I found some excellent restaurants in the area that all welcomed children, also in Hayle there is also a very good pizza restaurant with a nice patio area. The budget is helped by a large Lidl store just as you enter Hayle. To get to the wonderful beach you take the road to the Towans and follow it round till it brings you to a large car park, there are two ways down to the beach one is by steps which are quite steep, the other is a slopping pathway which is a lot easier but I would not say any are disable friendly. The large golden beach streaches for 3 miles and is glorious, with large sand dunes at the rear, giving hours of fun to the children. The beach is very clean as is the sea and it is not heavy with sea weed, but it is very popular with surfers and sand kite people, but there is room for all. Hayle is on the Atlantic side of Cornwall so it does get some strong winds but it is only about 20 miles to the other side of the coast which is more sheltered but not quite as nice beach. Along this coast line there are many little coves and bays that you can pull into and explore so there is plenty to keep you busy, on rainy days there are attractions around in Penzance and St Ives which keep most people happy, this is very attractive part of our country.